About | J.A. 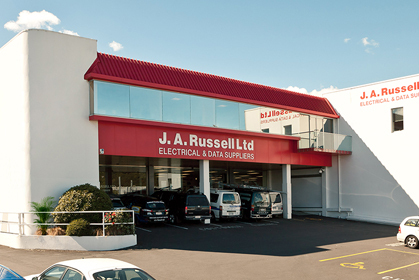 Russell Ltd.
As a proud New Zealand owned business we have been a trusted name to the electrical industry since 1951. We operate across the country as J. A. Russell Ltd and Radcliffe Electrical. With over 700 staff across 73 branches nationwide, we provide design solutions and advice to the trade. We pride ourselves on stocking the best quality compliant product from leading suppliers and manufacturers. Working alongside our customers is our award winning Lighting Solutions team providing expert advice on all lighting requirements, our dedicated Data & Technology team consisting of experienced installers who can provide technical assistance and “hands on” advice with all network installations and our regionally based Contracts team who specialise in the compilation and delivery of timely, accurate and competitive open tender quotation requests. Talk to our team about your project. We specialise in getting good quality products to you in full and on time. The business was founded in 1951 by Jack Spooner, Albert Hopkins and Russell Williamson. They combined their first names into J. 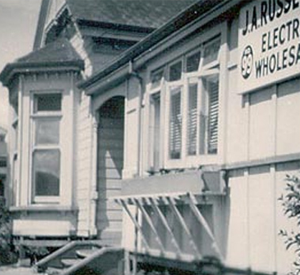 A. Russell Ltd.
Jack, Albert and Russell saw an opportunity to take up a cable agency and to start a new style of electrical wholesale business. They began with an old house in Grafton Road, Auckland as their warehouse and office. A high level of personal service to customers resulted in spectacular growth and the motto – still used in the business today – was born: The House for Top Service. in virtually every aspect of the business assumed the role of Managing Director. Roger’s brother John Spooner joined the business in 1977 and today the company is jointly owned between the Family Trusts of Roger Spooner and John Spooner. Roger and John still work in the business as do other family members really creating a good kiwi owned and operated family business. During the 1990s, with Roger Spooner and John Spooner at the helm, J. A. Russell embarked on a new phase of expansion acquiring branches in Waikato and Northland, and then a network in the Bay of Plenty. In 2002, Craig Grammer was appointed to CEO. Subsequently J. A. Russell took the opportunity to acquire the business of Christchurch based Radcliffe Electrical, which provided an 18 branch network coverage in the South Island. Radcliffe Electrical was a strong, well established brand in the South Island and we continue to trade using the Radcliffe Electrical brand in the South Island. In 2014, we acquired the 13 branch network of Stewarts Electrical supplies, extending our branch coverage to include the Lower North Island. In April 2017, we took over the lease of the General Cable facility in Mt Wellington Highway, Auckland and procured four cable rolling machines allowing us to offer this service to our customer base and branch network. In June 2017, the business acquired Swanson Electrical in Gisborne. This acquisition resulted in the addition of two more branches to the J. A. Russell Ltd network. The branches operate under the J. A. Russell Ltd brand. Today we have 73 branches across the country and operate under 2 brands: J. A. Russell Ltd and Radcliffe Electrical. We have been in business for over 65 years and are the largest New Zealand owned, electrical wholesaler in the country. We employ over 700 staff, including over 100 sales reps on the road. We are passionate about the electrical industry and sincerely value our relationships with both our customers and suppliers..